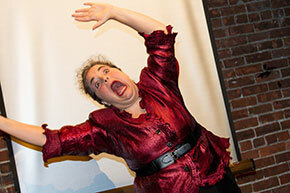 Kenneth Prestininzi’s Birth Breath Bride Elizabeth (starring Stephanie Burlington Daniels) was featured as part of ArtsEmerson’s inaugural The Next Thing Festival. Held together by good manners, intellectual rigor and a need to change how people think about a woman’s body, Mary Shelley-Breath (Stephanie Burlington Daniels) gives birth to a newly imagined feminist manifesto that appropriates Frankenstein, Princess Diana, Elvis Presley, and bridal madness in the throes of late Capitalism. 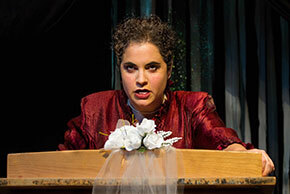 Kenneth Prestininzi’s Birth Breath Bride Elizabeth is as much a crackpot lecture gone awry as it is a serious performance of one woman’s powerful need to name and tame the hungry id roaming unchecked inside us all. Sleeping Weazel premiered Birth Breath Bride Elizabeth in September 2012 as part of its inaugural season opener, Women and Manners: are we done yet?